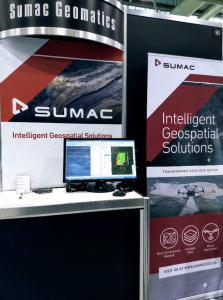 Sumac Geomatics exhibits at PDAC 2018 - Sumac Geomatics Inc.
Toronto – For the third year in a row, Sumac exhibited at the annual meeting of the Prospectors and Developers Association of Canada (PDAC), March 3-7, 2018. 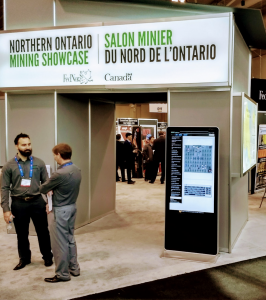 Since we are based in Thunder Bay, at PDAC we joined 100 other firms in the Northern Ontario Mining Showcase Pavilion, showcasing the regions mining service and supply companies. Over 25,000 attendees visit PDAC every year from across Canada and around the globe. For us it is an opportunity to meet with contacts as far away as Africa and South America. It also helps us ensure that we keep our fingers on the pulse of the newest sensing technologies used in the mining sector. Given the advantages that Sumac’s technical services bring to exploration, a benefit of PDAC is the opportunity to meet with geologists and exploration managers in attendance. Ahead of any UAV mapping or GIS services that Sumac provides, are our capabilities to process and interpret large volumes of remotely-sensed data. For over a decade, we have provided remote sensing services including aerial photography and lidar, air photo interpretation and high-resolution UAV surveys. Aside for conventional topographic mapping, our portfolio of projects requires us to deliver statistically-sound data products within short time-frames. The result is that not only do we operate professional-grade computer processing infrastructures capable of processing very large datasets, we have a team of analysts with the experience to understand the implications of the processing techniques applied and impact upon the quality of the client deliverable. We have customers located considerable distances away from Sumac’s home base that see opportunities in operating their own UAV fleet, but do not have the capabilities to process and interpret the data that they collect. Increasingly we now provide UAV data processing services to these types of firms, and PDAC provided the opportunity to highlight these capabilities to firms located not only outside of the Province of Ontario, but outside of Canada too. New services that caught attention at PDAC were UAV-based magnetic surveys. Magnetometer technology has been used for a considerable number of years to help mineral exploration firms identify changes in the magnetic field across the target site to highlight anomalies which suggests targets to explore further. Over large areas, airborne magnetic surveys are used to take an overall view of the regions of interest, field crews typically then walk the bush using ground-based magnetometers to capture higher resolution data. Ground-based surveys bring questions related to accessibility, time, cost and risk. Magnetometer antennas are available with form factors suitable for UAV operations, and it is now being demonstrated that the lower altitude of a UAV can permit anomaly maps of increased resolution to be produced that enable magnetic anomalies to be identified that might be overlooked otherwise. In most cases issues relating to accessibility, time and risk are minimized when using UAV over undertaking a ground survey. At a technical-level, magnetic surveys require much more than being able to fly the magnetometer payload. The success of a survey is highly dependent upon how the payload has been mounted, the flight plan, and how the data is processed and interpreted. Sumac has invested considerably in its magnetic survey expertise. Through an industry collaboration with Queens University, mechanisms have been developed that reduce redundancy and increase efficiency in the data collection workflow of UAV magnetic surveys, together with processing methods that ensure that the magnetic data being delivered conforms to industry standards. The lead Research Assistant on this project is Callum Walter (under the supervision of Dr. Alexander Braun and Dr. Georgia Fotopoulos). Callum has already received 6 awards for his work so far, including the SEG/Lucien LaCoste Scholarship from the Society of Exploration Geologists, due to his research already addressing significant previously unanswered questions when applying UAV magnetic surveys to target detection. We will be describing the solution that we have worked on with Callum, in future blogs and publications throughout this year. Sumac Geomatics wishes to thank both the Northern Ontario Mining Showcase and FedNor for all of the arrangements that enable Northern Ontario based SMEs such as ours to promote our services and access ever larger markets. The Global market access that we enjoy, would be much more difficult without the support of these organizations and initiatives such as this.